If a student excels in maths and cannot write a single sentence of English without misspelling it, should it be assumed that he or she has a disability? One’s ability could be a disability for another, and vice versa. All of this points to why ‘disability’ is becoming an increasingly ugly word in the world of Education. Teachers learn to distinguish students for their abilities and strive to improve their limitations. Some students may have inabilities that are more daunting than others. However, at the end of the day, it is the teacher who nurtures and harnesses those hidden talents and abilities that parents and even students themselves were ignorant of. As a Special Educator, one comes across an entire spectrum of so-called disabilities among children. To name a few Autism, Down Syndrome, Mental Retardation, Learning disabilities like Dyslexia, Dyscalculia, Dysgraphia and many such conditions. As large as this spectrum of conditions is, one comes across numerous ways in which parents and students deal with them in their daily lives. Parents may seem overprotective or even defensive when it comes to acknowledging the fact that their child may actually have any such conditions. Early, identification and intervention are always beneficial for such children. But some parents, in their haste to cushion their child’s shortcomings, may be overeager to label them as having an issue. However, a common factor always seems to be anxiousness. Parents’ anxiety over how to deal with the child, or how facilities can be provided to help the child adapt to his/her environment and most importantly, what the future might hold for their child seems to be unending/overwhelming. As a teacher, it is one’s resolve to provide a sense of ease and comfort to parents, and a reservoir of understanding and resources towards the students. Every classroom is like a bouquet of flowers. Each and every child has his/her unique way of contributing towards the beauty and fragrance of this exquisite bouquet. The Darwinian evolutionary theory of the ‘Survival of the Fittest’ looms large in a classroom full of students. When students who need more attention and more effort to deal with their limitations are mixed into the classroom paradigm, the task becomes a lot more challenging for teachers. The only tools one has are observation and facilitation. In this endeavor, music, dance, theatre, art, and crafts seem to be a universal tool that transcends all so-called disabilities. The world of arts can open new horizons for students who have difficulties with traditional teaching methods. These are intellectual disciplines in themselves that require complex thinking and problem-solving. Arts present students with the opportunity to construct their own understanding of the world. Music imbibes a sense of rhythm, melody and pitch in children. Musical beats can help children learn rhymes and other features of reading such as phonological awareness. Dance provides children with a means of expression and rhythm. Using repetitive songs to learn academic facts (like the alphabet song or multiplication tables) instills principles and order in an easier and fun manner. Performing plays provide an opportunity for children to immerse themselves in a theme and learn about it in a profound and interesting way. Drawing and painting reinforce motor skills. It can also be a way of familiarizing children with shapes, contrasts, boundaries, spatial relationships, size and even mathematical concepts. Such activities can help children with learning disabilities overcome the challenges they face in learning in myriad ways. Most importantly, it gives them a feeling of self-worth. It gives them the confidence that they are capable of doing something. Students who face learning and other disabilities are often compelled to feel that they are incapable of learning because of their inabilities in school. Therefore, this becomes an essential part of the learning process. In conclusion, as a teacher and as a human being, one has to accept that there is a world that is bigger than all of us, where the lines that define abilities and limitations are blurred. One has to push one’s limits and extend understanding, compassion, empathy and kindness in any and all interactions with each and every student. That is the true purpose of being a teacher, and that is the paramount duty of being an educator. 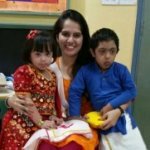 Pallavi Sud is a Special Educator working in Delhi, India. She has been working in the disability sector for the last 9 years. She has worked in both Special set up with multi disability kids and in an inclusive set up with learning disability kids. Her motto in life is “Every child is unique and has unique mission”. As educators it is our duty to help them actualise their potential and live a happy life as part of the society.